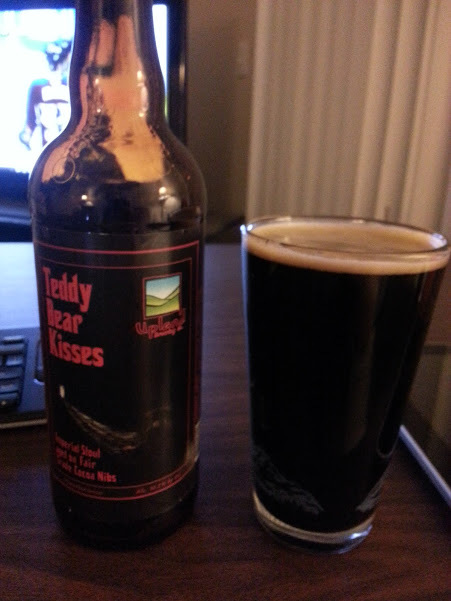 Upland's Teddy Bear Kisses is an Imperial Stout with 10.2% ABV and 80 IBU. It has a specific gravity of 26.5, and the color is 63.4 SRM. I served Teddy Bear Kisses from a bottle. It pours a very dark brown, basically black. There was a thick, tan head, with fairly long retention and some lacing. The aroma had strong roasted and chocolate scents. The taste starts with strong chocolate, and the accompanying chocolaty bitterness. Then, it mixes with the roasted malts, and finishes with a lingering dark cocoa. Despite the high ABV, the alcohol taste is fairly well hidden. It had a creamy mouthfeel, and medium body and carbonation. 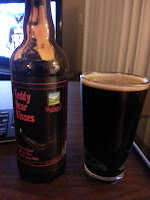 Teddy Bear Kisses was a very good Imperial Stout, unfortunately it's a seasonal and won't be readily available for a while. I'll definitely be looking forward to Teddy Bear Kisses when it comes out again next fall.